I really need to get myself to a farmer’s market. You’d think that me, the foodie that I am, living in rural New Jersey, I would be at a market every week. Well, that’s not the case. I have been to a farmer’s market twice(?) in my life. Both times were at the same market and once was with a friend and her mother, the second was with my dad. But this market has very minimal items and i was never impressed. Only one or two farmers, and the rest of the few stands were cheese, baked goods, and random other things that really would interest no one. I know there are other markets in my area. They aren’t exactly close, but they sound like they would have better options. I really need to step up my “buy-local in-season” game and force one of my parents to bring me. (I would go myself…but they have the money!). So where to I get my produce? I stock up every week at my lame grocery store. Gotta do whatcha gotta do. The selection there isn’t so grand either, but once in a while they will get a new interesting piece. But when I really want to try something fun, I get a little help from my dear friends at Frieda’s! Once in a while they will ask me to put together a list of some produce and they send me a box full of goodies. With my most recent box, I requested some cauliflower. What arrived was a beautiful huge (very big!) 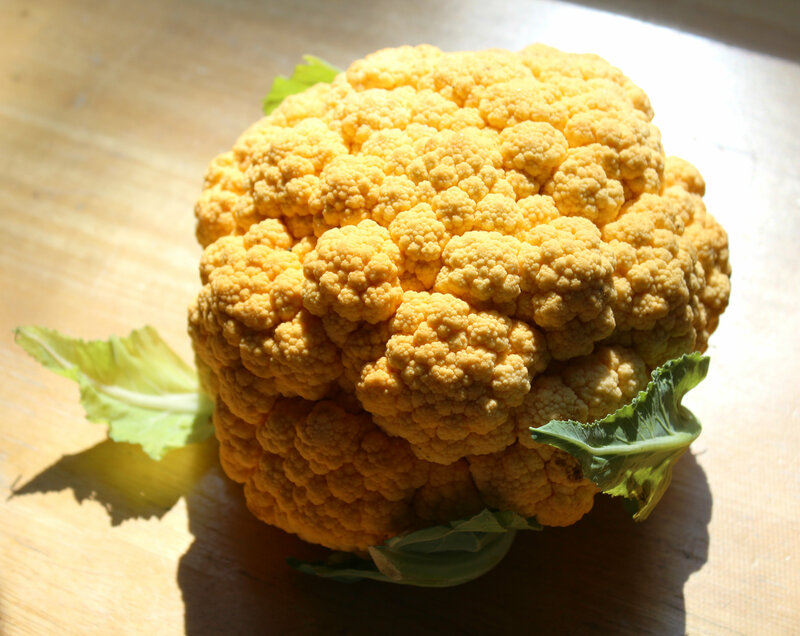 head of yellow cauliflower! So yummy, but what to do with it? Now I love steaming veggies or keeping them raw. And of course roasting, but I wanted to do something a little different. Plus I had a random bag of Shirataki Fettucchini noodles sitting in the pantry. So what did I come up with? 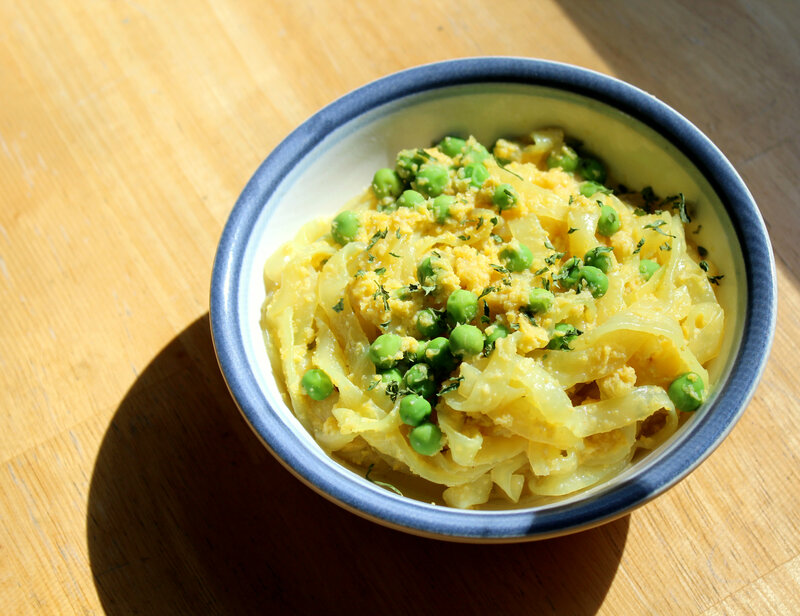 Nut-Free vegan mac n- cheeze! Instead of using cashews like many vegan mac n- cheezes do, I used cauliflower and nutritional yeast! I had no idea how this would taste, but you know what they say, “go cauli-crazy or go home”…or something like that. At least this would be completely allergy friendly. Even my no nuts friends can enjoy it. I’m tellin’ you, you can make everything allergy friendly…and taste good too! 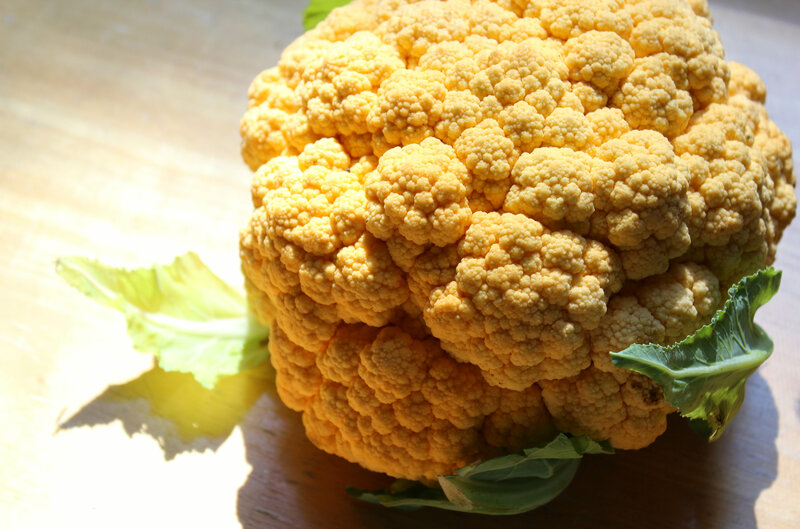 + In a microwave safe bowl, add the 3/4 cup of chopped cauliflower with 1/4 cup water. Microwave on high for 2 minutes. Safe 2 TB of hot liquid. 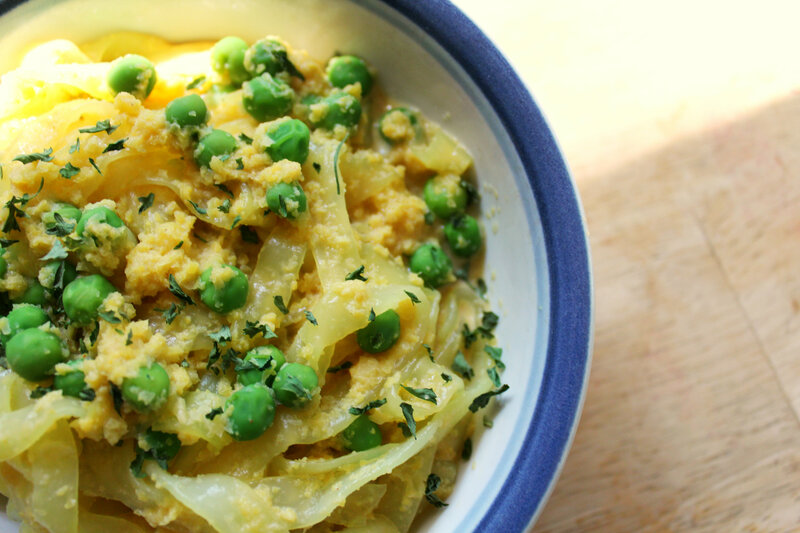 + In a food processor, add the steamed cauliflower, 2 TB of liquid, nutritional yeast, garlic, onion, paprika, and pepper. Puree until you get a pretty smooth sauce. 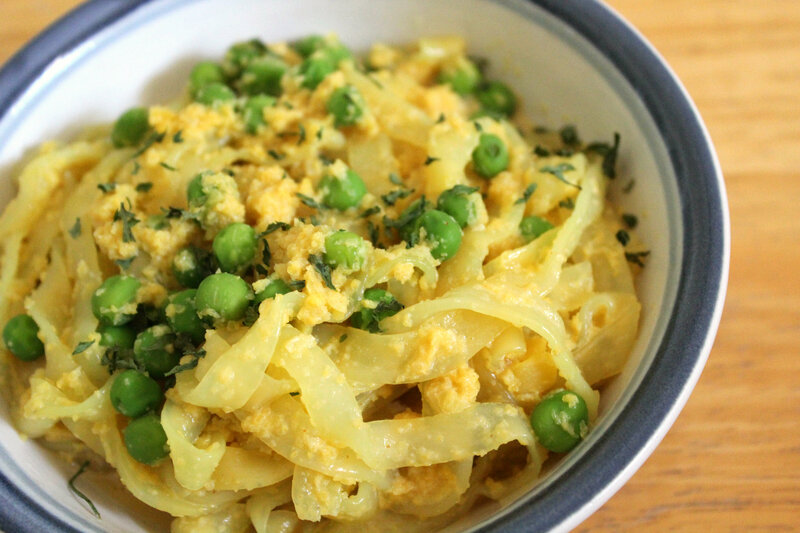 + In a small pot, add the shirataki noodles (rinsed under cold water), cauliflower sauce, dijon, and peas. Cover the pot and heat on medium for about 5 minutes. Stir and let sit for 3 minutes. Transfer to a bowl, top with parsley, and dig in! + Do you go to farmer’s markets every week? Once in a while? Or not at all? + Do you stick to the same produce every week or do you like to get innovative and switch things up? + Any cool veggie uses you have come up with lately? Do share!